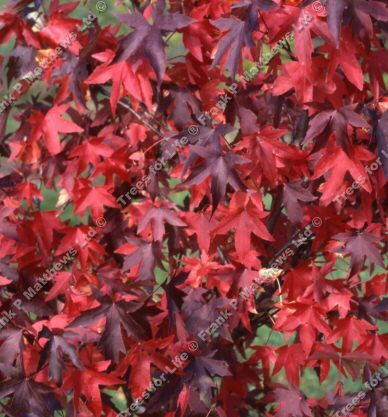 Emanating in the eastern United States, the Sweet Gum tree (Liquidamber styraciflua) is a handsome species grown for its attractive, glossy, maple-like leaves that can turn brilliant crimson, purple and orange in the autumn. As these trees are seed grown there is considerable and interesting variation in the intensity of the autumn colours. The older stems have corky bark. This tree is supplied at a height of 100-180cm in a 7-12 litre container for year round planting and better results than from either bare-root or rootballed stock. Dear dogsbody, As one of the oppressed race like yourself, I have been tasked with the job of replying to your e-mail. My partner, Patsy and I are delighted with the condition of the Sweet Gum tree, and I am sure he/she/it will grow up to be a credit to you and your nursery. We have given it a drink and will plant it tomorrow when the phases of the moon are in confluence with our house and the oblicuity of the ecliptic is correct. I have been tasked to mention that when Patsy spoke to one of your minions (or even your gooodself), she was told the tree was an evergreen, is this in fact correct? as there are no leaves present? Many thanks, Alan, a pleasure to do business with such a lively company. Editors note: Gum trees e.g. Eucalyptus are evergreen, however this tree is deciduous.